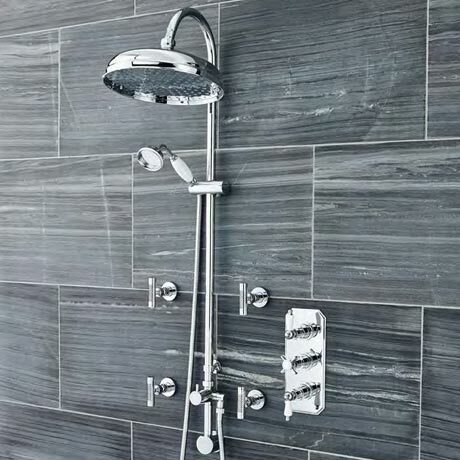 The Traditional Triple Concealed Thermostatic Shower with Luxury Shower Kit & 4 Body Jets from Ultra is part of our luxury period collection of chrome plated brass bathroom products. Features a fixed 300mm diameter shower head on a curved arm, an additional shower handset with ceramic handle, a concealed elbow and 4 adjustable body jets, perfect for creating a shower that massages you. Attractive face plate with crosshead & lever controls.